I had trouble getting to sleep last night (I've reached the point where I wonder whether I should keep trying to get on local time, or start moving back to home time), so I turned on the TV. Sky TV was showing the CBS Evening News, and the news was, of course, almost entirely about Hurricane Katrina. The scenes of devastation were just jaw-dropping. hurricane. The book meandered through a bunch of global warming policy stuff that was mildly interesting, but not gripping, until it got to the last 50 or so pages, which was a really fascinating story of a disastrous flood hitting DC. Only...as far as I can tell, Katrina is worse. It's been a while since I've read the book, but I don't remember the death, the lack of clean water, and all the other horrors we're hearing about on the news. You know things are bad when a disaster outdoes science fiction. 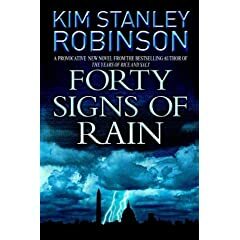 On a literary note, if you're looking for weather-related science fiction, I definitely recommend Forty Signs of Rain over Mother of Storms, which to me was just ridiculous. It started out kinda interesting, but then blundered down a "nanotech is magic" path that (in my mind) ruins so many promising books. Forty Signs of Rain was much more realistic...I'm almost afraid to read the sequel, Fifty Degrees Below. It's coming out right before winter sets in. Well, I'm in Edinburgh right now, waiting for the conference dinner to start. First of all, I've got an excellent view from my hotel room. I really like the castle, and it's great to just glance out at it. Yesterday was my "free" day, so I decided to head to a pair of modern art museums. I actually just enjoyed an excuse to wander through the streets of Edinburgh. First up was the Dean Gallery. Mostly the usual gang of surrealists. The one "find" of the day was Yves Tanguy, whose work I enjoyed more than most of the surrealists. I can't find web versions the paintings I saw, but this one gives the general feeling. Then it was across the street to the Scottish National Gallery of Modern Art. Here my favorite piece is actually visible in the picture. It's Jencks' Landform...a beautiful green spiral-ly landscape feature in front of the museum. I particularly liked how it evoked the green hills of the Scottish Highlands, while it rose to a perch from which you could view the museum, just like you can view Edinburgh from Arthur's Seat. Tomorrow, I head into the actual city of Edinburgh, which I recall (it's been 10 years) as one of the cooler cities I've visited. For today, however, I'm safely ensconced in Hilton-land. I'm ordering room service, going to the hotel pool, surfing the Internet -- I could be practically anywhere (well, I did order fish and chips). Part of me feels like I should be off sight-seeing, but I really need a day to relax and get adjusted. 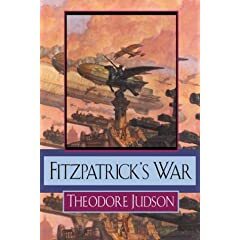 On the plane ride over, I finished Fitzpatrick's War. Lately I've been choosing my reading a bit more carefully than I used to -- there's only so much time for reading, after all. With this book, however, I picked it up because I became intrigued by the cover while we were waiting in line at Mysterious Galaxy last month for the Jasper Fforde book signing. It turned out to be "future history" book about a 25th century where electricity was unusable due to the machinations of an elite technocratic secret society. In fact, the elite secret society schtick gets a bit tiring in SF novels, and it's probably the weakest point of this book. Fortunately, the society is not the primary focus of this book. Instead, it tells the story of one of Fitzpatrick's compatriots, Robert Bruce. Fitzpatrick is a latter-day Alexander the Great, conquering the world at a young age (and dying before he gets to enjoy his rule). Lest you think I am giving away too much, this is all revealed in the prologue, which is written by a 26th-century historian. The historian's frequent footnotes attempting to discredit Bruce's story add a bit of levity to the book. The book takes place in a well-imagined future world -- probably the best part of the book. The plot is mildly interesting (maybe more so for Alexander devotees), and the characters are well-drawn enough. The ending doesn't really leave room for a sequel, which is probably just as well...the author could probably do a better job in his second SF novel setting things up. I know I'm not supposed to be napping right after I cross the pond. Not the way to adjust to jet lag, and all that. But did they have to set off the fire alarms in the middle of my nap? Just what I need, to be standing in front of the Hilton Edinburgh Airport in my pajamas and bare feet. (I did have time and the sense to put a shirt on.) You know, it may say summer on the calendar, but it's not that warm here in Scotland. Oh, well. Besides this and the security breach at Dulles that caused them to evacuate the terminal (doesn't even make the news any more, does it? ), it's been an uneventful trip. The last time I flew anywhere and connected through Heathrow was December 1993. This was much the same -- same airlines, same riding around in shuttle buses. My luggage made it this time, though. New York is the 9th state in which I've spent the night in the last two weeks. Tonight I'm in Albany, at the Hampton Inn, where I'm burning some hard-earned Hilton points. I had a nice time visiting Christina's writing conference. She goes to many conferences I attend -- I think both of us enjoyed turning the tables so she could share with me some of her professional life. After thinking about it, Ben and I definitely stayed in Kansas in '92. We drove through Kansas to get to Colorado. We ended up at Boulder in the afternoon. In the days of 55 miles/hour speed limits, there's no way we made it all the way across Kansas to Boulder before 4 in the afternoon. It just doesn't feel like a normal day if I don't drive hundreds of miles in one direction or another, so yesterday I loaded up the car and headed up to Vermont to visit Christina at the Bread Loaf Writers' Conference. This time, however, I dropped Teddy off at the kennel. I got in at 7:30 last night. I was delayed somewhat by a 9/11 motorcycle ride taking place from DC to New York the same day. I hope this isn't callous, but is disrupting the nation's transportation system really the right way to commemorate September 11th? Then again, I'm not sure the wet T-shirt contest is the right way, either -- though in a strange way, maybe it is. Anyway, after checking in to the Blue Spruce Motel, we went to the staff reading, where members of this year's conference staff, including Christina, read 4-minute selections. Christina read a selection from her novel in progress and a poem. Both were well-received. Well, after all that, I made it home. Now I just need to unload the car, convince the cat to come downstairs...maybe after a good night's sleep. Here are a couple more pictures I took. Here is Teddy in Nebraska. In my list of states I've stayed overnight in, I get to add Nebraska. I'm not sure whether Kansas should be on the list...Ben and I can't remember if we stopped there going cross-country in '92. If you don't remember it, does it count? My plan originally called for adding Wyoming and South Dakota. That would have been a reasonable way to get to Minnesota, except for one thing...Sturgis. Even 540 miles away in Albert Lea, the motorcycles were in evidence. I can only imagine how crowded it would have been close up. It might have been fine...but if it wasn't, it would have been a really stupid reason to be late for my grandmother's funeral. Greetings from Woodstock, Illinois -- possibly my last Super 8 on this trip. I left Albert Lea around 4 and got in around 11 (Central). We had a very dignified, elegant service for Grandma today. (By the way, here is a corrected obituary.) It was held at the First Presbyterian Church, where my parents were married, and I was baptized. I won't attempt to do it justice by describing it right now, but my mother gave a very nice eulogy that she will perhaps give me permission to post here. Afterwards, we headed to the cemetery where she was interred next to Grandpa. Then the family went to Cafe Don'l for a lunch and reminiscences of Grandma. It was nice getting to spend time with my cousins. I'm using the Internet access in my mother's hotel room while she walks Teddy. (Albert Lea hotels make you choose -- Internet or pets.) I got in around 7, and we had dinner at Perkins. She showed me the church where services will be tomorrow. I have to get up early and drop Teddy off at the kennel first. Greetings from the Super 8 in Ogallala, Nebraska. Part of Nebraska is in the Mountain Time Zone -- who knew? I don't have cell phone service out here, but I do have Internet. 95% of my driving today, however, was in Colorado. Colorado has many scenic vistas along I-80. More imposing than Utah; each has its own attractions. I-76 through Colorado was where my journey veered off to a path I had not crossed in 1992. Not too exciting...the eastern part of Colorado definitely consists of "Great Plains" boredom. Greetings from Fruita, Colorado! I have made it through the Beehive State, and I now have Internet access. Allow me to share with you some of what I've seen. First up is the Cedar City, Utah Super 8 at around 2 AM. We follow that with a scenic vista or two off I-70. I last was in Utah in May 1993, visiting Martin, who was living out there then. I had forgotten how pretty -- I can't think of a better word -- the scenery is. Will Have Better Luck In Colorado. In Motel. Trying To Connect Laptop. Late Getting To Utah Tonight. I Hate Southern California Traffic. As the summer draws to a close, I can think of many things we meant to do that we never did, but also many things we did. One of the things I meant to do was chronicle the things we did more closely. In that spirit, I want to share some pictures we took this summer of the various fun we had out here in Southern California. About four weeks ago, we went to a hot dog roast one evening with people from work. Despite the overcast day, we had a good time, cooked hot dogs, and then followed them up with marshmallows. Here is Grandma's obituary from today's Albert Lea Tribune. My grandmother passed away last Saturday at the age of 94. I last saw Grandma in May...she was the most amazing mix of clarity and confusion I have ever seen. At one minute she was speaking beautifully about her gratitude for the years of marriage with my grandfather, and another moment she was telling me a garbled story about myself, obviously unclear to whom she was speaking. I think the experience can be best summed up by her statement, "I'm not sure who these people are who are sending me cards and letters, but it is wonderful that they remember and care about me." In her earlier days, Grandma was, of course, clearer. She did many things in her life...raised two successful daughters, learned to invest in the stock market, and was very generous with her family. When someone reaches 94, you almost expect them to be around forever, and it's hard to believe she's gone. I'm leaving California Thursday afternoon. The funeral is Monday in Albert Lea, Minnesota, where she spent the last sixty-some years.